For senior undergraduate/beginning graduate courses in computational chemistry or molecular modeling for students of chemistry, biochemistry, or medicinal chemistry. 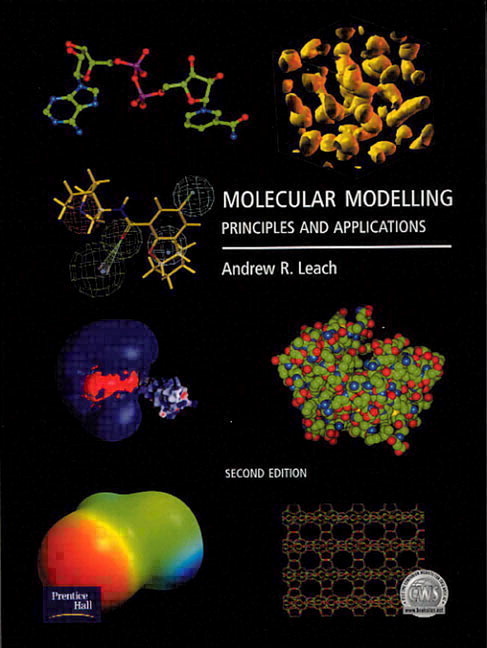 This book provides a detailed description of the techniques employed in molecular modeling and computational chemistry. The first part of the book covers the two major methods used to describe the interactions within a system (quantum mechanics and molecular mechanics). The second part then deals with techniques that use such energy models, including energy minimization, molecular dynamics, Monte Carlo simulations and conformational analysis. The author also discusses the use of more advanced modeling techniques such as the calculation of free energies and the simulation of chemical reactions. In addition he considers aspects of both chemoinformatics and bioinformatics and techniques that can be used to design new molecules with specific properties. Many of the topics are treated in considerable depth but the student is assumed to have only a basic knowledge of the relevant physical and chemical principles. Theory explained using simple numerical examples. Theory and knowledge needed to make decisions and solve problems emphasized. NEW - Expanded discussion of density functional theory, bioinformatics/protein structure analysis, chemoinformatics, drug design, materials science, and modeling of the solid state. NEW - Introductory chapters on quantum mechanics split in two (Chapter 2 and Chapter 3). NEW - Extensive, updated references for each chapter. Chapters stand independently, but are cross-referenced backwards. —Includes links to related websites and pre-built 3-D models that can be viewed using Chime. Expanded discussion of density functional theory, bioinformatics/protein structure analysis, chemoinformatics, drug design, materials science, and modeling of the solid state. Introductory chapters on quantum mechanics split in two (Chapter 2 and Chapter 3). Extensive, updated references for each chapter. 1. Useful Concepts in Molecular Modelling. Coordinate Systems. Potential Energy Surfaces. Molecular Graphics. Surfaces. Computer Hardware and Software. Units of Length and Energy. The Molecular Modelling Literature. The Internet. Mathematical Concepts. 2. An Introduction to Computational Quantum Mechanics. One-electron Atoms. Polyelectronic Atoms and Molecules. Molecular Orbital Calculations. The Hartree-Fock Equations. Basis Sets. Calculating Molecular Properties Using ab initio Quantum Mechanics. Approximate Molecular Orbital Theories. Semi-empirical Methods. Hückel Theory. Performance of Semi-empirical Methods. Appendix 2.1: Some Common Acronyms Used in Computational Quantum Chemistry. 3. Advanced ab initio Methods, Density Functional Theory and Solid-State Quantum Mechanics. Open-shell Systems. Electron Correlation. Practical Cconsiderations When Performing ab initio Calculations. Energy Component Analysis. Valence Bond Theories. Density Functional Theory. Quantum Mechanical Methods for Studying the Solid State. The Future Role of Quantum Mechanics: Theory and Experiment Working Together. Appendix 3.1: Alternative Expression for a Wavefunction Satisfying Bloch's Function. 4. Empirical Force Field Models: Molecular Mechanics. Some General Features of Molecular Mechanics Force Fields. Bond Stretching. Angle Bending. Torsional Terms. Improper Torsions and Out-of-plane Bending Motions. Cross Terms: Class 1, 2 and 3 Force Fields. Introduction to Non-bonded Interactions. Electrostatic Interactions. Van der Waals Interactions. Many-body Effects in Empirical Potentials. Effective Pair Potentials. Hydrogen Bonding in Molecular Mechanics. Force Field Models for the Simulation of Liquid Water. United Atom Force Fields and Reduced Representations. Derivatives of the Molecular Mechanics Energy Function. Calculating Thermodynamic Properties Using a Force Field. Force Field Parametrisation. Transferability of Force Field Parameters. The Treatment of Delocalised … Systems. Force Fields for Inorganic Molecules. Force Fields for Solid-state Systems. Empirical Potentials for Metals and Semiconductors. Appendix 4.1: The Interaction between Two Drude Molecules. 5. Energy Minimisation and Related Methods for Exploring the Energy Surface. Non-derivative Minimisation Methods. Introduction to Derivative Minimisation Methods. First-order Minimisation Methods. Second Derivative Methods: The Newton-Raphson Method. Quasi-Newton Methods. Which Minimisation Method Should I Use? Applications of Energy Minimisation. Determination of Transition Structures and Reaction Pathways. Solid-state Systems: Lattice Statics and Lattice Dynamics. Calculation of Simple Thermodynamic Properties. Phase Space. Practical Aspects of Computer Simulation. Boundaries. Monitoring the Equilibration. Truncating the Potential and the Minimum Image Convention. Long-range Forces. Analysing the Results of a Simulation and Estimating Errors. Appendix 6.1: Basic Statistical Mechanics. Appendix 6.2: Heat Capacity and Energy Fluctuations. Appendix 6.3: The Real Gas Contribution to the Virial. Appendix 6.4: Translating Particle Back into Central Box for Three Box Shapes. 7. Molecular Dynamics Simulation Methods. Molecular Dynamics Using Simple Models. Molecular Dynamics with Continuous Potentials. Setting Up and Running a Molecular Dynamics Simulation. Constraint Dynamics. Time-dependent Properties. Molecular Dynamics at Constant Temperature and Pressure. Incorporating Solvent Effects into Molecular Dynamics: Potentials of Mean Force and Stochastic Dynamics. Conformational Changes from Molecular Dynamics Simulations. Molecular Dynamics Simulations of Chain Amphiphiles. Appendix 7.1: Energy Conservation in Molecular Dynamics. 8. Monte Carlo Simulation Methods. Calculating Properties by Integration. Some Theoretical Background to the Metropolis Method. Implementation of the Metropolis Monte Carlo Method. Monte Carlo Simulation of Molecules. Models Used in Monte Carlo Simulations of Polymers. 'Biased' Monte Carlo Methods. Tackling the Problem of Quasi-ergodicity: J-walking and Multicanonical Monte Carlo. Monte Carlo Sampling from Different Ensembles. Calculating the Chemical Potential. The Configurational Bias Monte Carlo Method. Simulating Phase Equilibria by the Gibbs Ensemble Monte Carlo Method. Monte Carlo or Molecular Dynamics? Appendix 8.1: The Marsaglia Random Number Generator. Systematic Methods for Exploring Conformational Space. Model-building Approaches. Random Search Methods. Distance Geometry. Exploring Conformational Space Using Simulation Methods. Which Conformational Search Method Should I Use? A Comparison of Different Approaches. Variations on the Standard Methods. Finding the Global Energy Minimum: Evolutionary Algorithms and Simulated Annealing. Solving Protein Structures Using Restrained Molecular Dynamics and Simulated Annealing. Structural Databases. Molecular Fitting. Clustering Algorithms and Pattern Recognition Techniques. Reducing the Dimensionality of a Data Set. Covering Conformational Space: Poling. A 'Classic' Optimisation Problem: Predicting Crystal Structures. 10. Protein Structure Prediction, Sequence Analysis and Protein Folding. Some Basic Principles of Protein Structure. First-principles Methods for Predicting Protein Structure. Introduction to Comparative Modeling. Sequence Alignment. Constructing and Evaluating a Comparative Model. Predicting Protein Structures by 'Threading.' A Comparison of Protein Structure Prediction Methods: CASP. Protein Folding and Unfolding. Appendix 10.1: Some Common Abbreviations and Acronyms Used in Bioinformatics. Appendix 10.2: Some of the Most Common Sequence and Structural Databases Used in Bioinformatics. Appendix 10.3: Mutation Probability Matrix for 1 PAM. Appendix 10.4: Mutation Probability Matrix for 250 PAM. 11. Four Challenges in Molecular Modelling: Free Energies, Solvation, Reactions and Solid-state Defects. Free Energy Calculations. The Calculation of Free Energy Differences. Applications of Methods for Calculating Free Energy Differences. The Calculation of Enthalpy and Entropy Differences. Partitioning the Free Energy. Potential Pitfalls with Free Energy Calculations. Potentials of Mean Force. Approximate/‘Rapid' Free Energy Methods. Continuum Representations of the Solvent. The Electrostatic Contributions to the Free Energy of Solvation: The Born and Onsager Models. Non-electrostatic Contribution to the Solvation Free Energy. Very Simple Solvation Models. Modeling Chemical Reactions. Modeling Solid-State Defects. Appendix 11.1: Calculating Free Energy Differences Using Thermodynamic Integration. Appendix 11.2: Using the Slow Growth Method for Calculating Free Energy Differences. Appendix 11.3: Expansion of Zwanzig Expression for the Free Energy Difference for the Linear Response Method. 12. The Use of Molecular Modelling and Chemoinformatics to Discover and Design New Molecules. Molecular Modelling in Drug Discovery. Computer Representations of Molecules, Chemical Databases and 2D Substructure Searching. 3D Database Searching. Deriving and Using Three-dimensional Pharmacophores. Sources of Data for 3D Databases. Molecular Docking. Applications of 3D Database Searching and Docking. Molecular Similarity and Similarity Searching. Molecular Descriptors. Selecting ‘Diverse' Sets of Compounds. Structure-based De Novo Ligand Design. Quantitative Structure-Activity Relationships. Partial Least Squares. Combinatorial Libraries. Dr. Andrew Leach is a Group Leader in Computational Chemistry and Informatics at Glaxo Wellcome Research and Development.